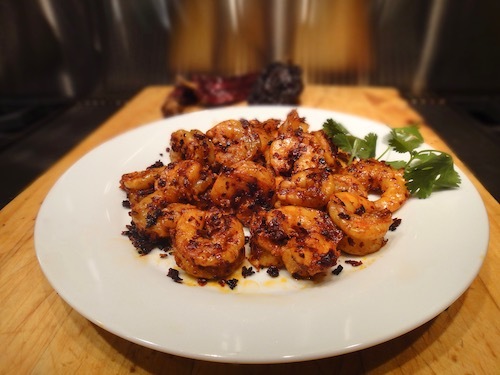 Last night I dreamed up this roasted cascabel chile shrimp recipe, with an underlying hint of anise, because I did not know what to cook, worrying about the immigration debacle happening at the Tijuana-San Diego border, with so many families fleeing death threats and torture in Central America, trying to save their children from the physical violence they have endured. Each of us can do something to help the situation, away from violence and toward solving a complex problem. Donate, when you can, to those working on the front line, sometimes dangerous lines, of immigration issues. I recommend “La Casa Del Migrante” in Tijuana, a shelter for immigrants. I started visiting La Casa Del Migrante back in the 1990’s helping them financially as far as I could. The Scalabrinian priests are not proselytizing fundamentalist, self-righteous missionaries. They are true servants helping the poor in need. I know this first hand. I visited their shelter, saw the faces of immigrants staring down desperate options, felt the trust they place in the Casa, where they can find a bed to rest, food, help with communications, legal assistance. You can donate by clicking here, before you try out my recipe, which I devised as I was thinking of the immigrant families. It’s a guajillo, but it’s also “cascabel” because in the region of Texas and Northern Mexico, that’s what we sometimes call the Guajillo Chile. Cascabel means a rattle, and the seeds rattle when you shake the dried chile. In central Mexico cascabel refers to a completely different chile, one in the same family as Guajillo, but round and plump, not long, shaped like a cherry. Chiles travel, and they change names as they go from one place to the next. I add a hint of anise, and it helps bring out the sweetness of perfectly delicious Gulf of Mexico shrimp. 1. In a molcajete (mortar) or spice grinder, grind the chiles, black peppercorns, anise seeds and salt into a coarse powder. 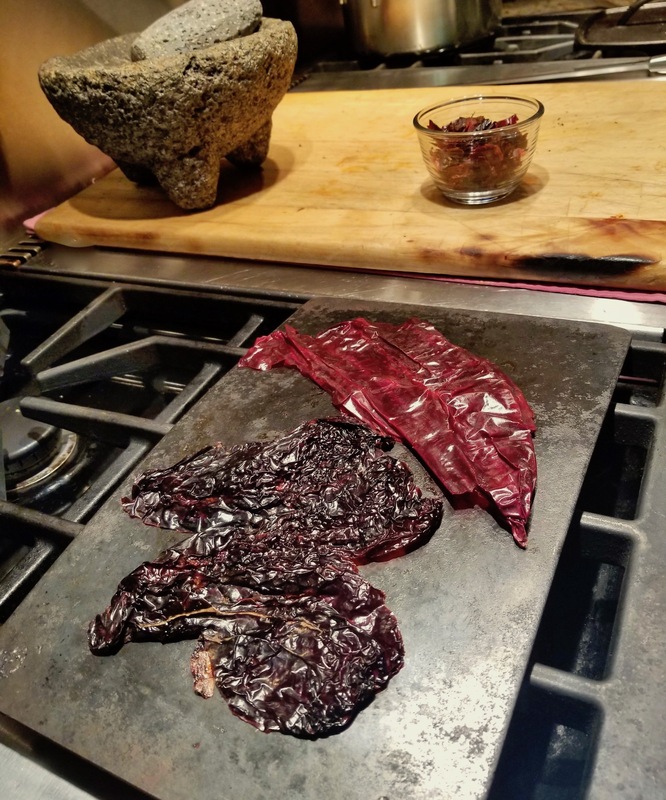 If the chiles are moist and a bit rubbery, dry them over a warm comal (not hot) for a couple of hours. 2. Peel and devein the shrimp, heads and tails off, then rinse and dry them. 3. In a bowl, combine the shrimp with the powdered chile mixture, making sure all surfaces of the shrimp are covered. You can proceed to step 4 or you can hold the shrimp in the fridge for up to four hours. 4. In a 10″ or 12″ cast iron skillet or nonstick skillet add the canola oil and place on high heat. When the oil begins to make little waves, before it starts to smoke, add the chile shrimp. Cook, tossing and turning the shrimp, for about 3 minutes, until the shrimp changes color to white, the flesh changing from translucent to opaque. Serve immediately on plates, sprinkling the top with the minced cilantro. Accompany with Mexican lime wedges. You could even serve these on a large platter with toothpicks. Great ideas to help us , buying local and cooking at home! Thanks Adam for the informative information on the Cascabel and other peppers. ,and most of all for this scrumptious looking recipe on these camarones! Great Holiday dish I believe, I’m very excited to try the anise seed, which I know I love!